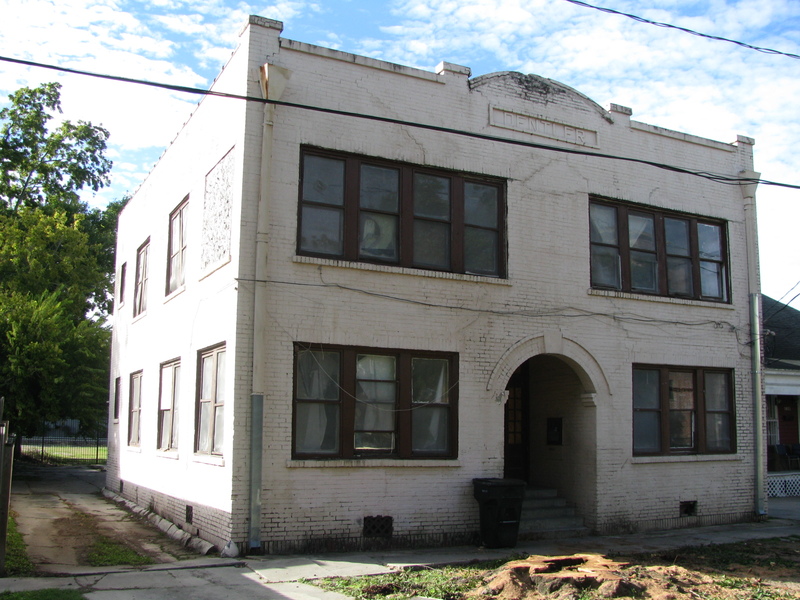 The Dentler Building came with 46 windows, so we knew that the handling of the windows would require careful attention. Our task was complicated by the poor condition of the original materials. 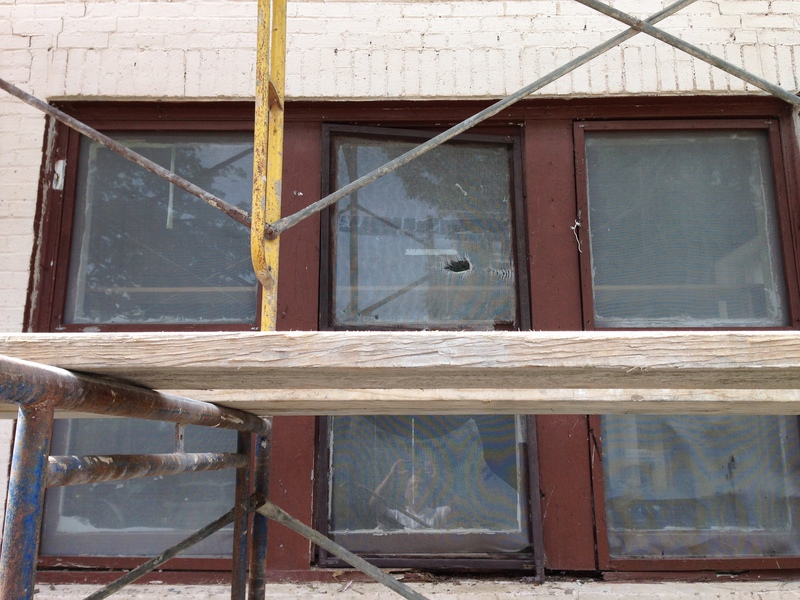 The window frames themselves were rotted and decrepit from years of water penetration. The sashes were in better condition for the most part, although some were missing, damaged or had had the glass panes replaced with Plexiglas. 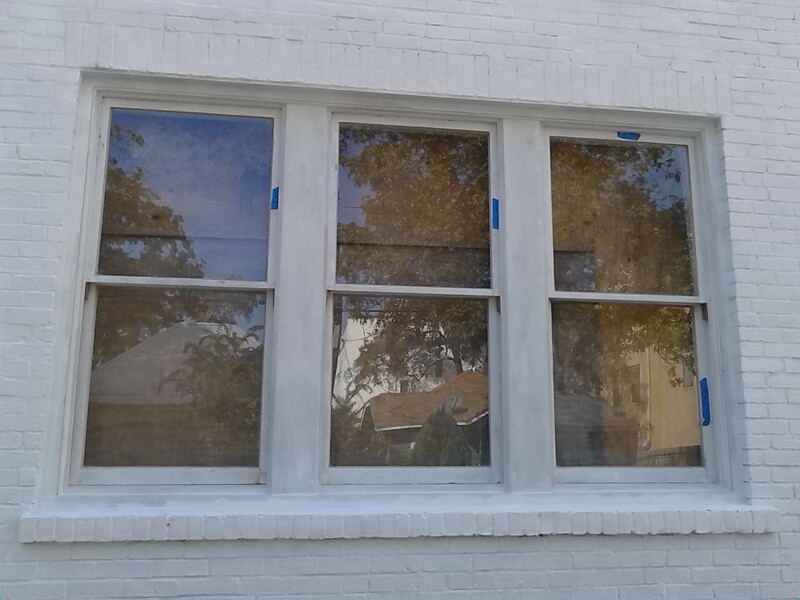 We thought about using commercially-available windows that have modern features like double-paned insulated glass and come in historic styles that could approximate the originals. But given how central the windows are in the appearance of this historic building, we really wanted them to look right. So, we turned to our favorite wood craftsmen at Giles Construction, who rebuilt all the window frames in treated lumber, painstakingly reproducing the detailing to match the original design. And we set about a complicated multi-step restoration of the sashes as well. It has taken a while, and we’re not completely finished yet, but we think it has come out very nicely. The windows are a key part of the building’s appearance. We wanted to honor that. Here’s a detailed Before picture. 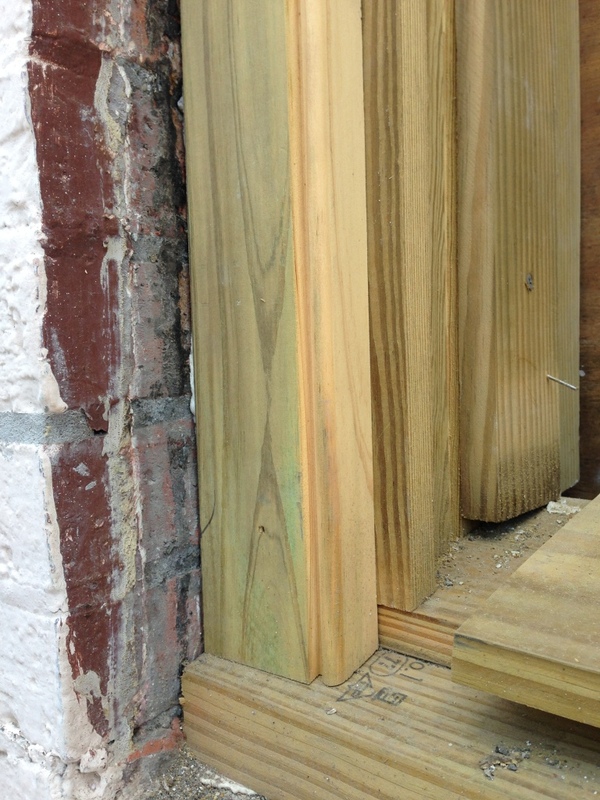 Notice the rotted sill at bottom. Pretty rough. Some of the sashes were missing altogether. We pulled out the sashes (the ones that were salvageable), and had them stripped, reinforced and re-glazed as necessary. Here is a stack of them, primed and ready to be reinstalled. Meanwhile, the construction of the new window frames was under way in parallel. This shot provides a look at the number of pieces and amount of detailing involved. 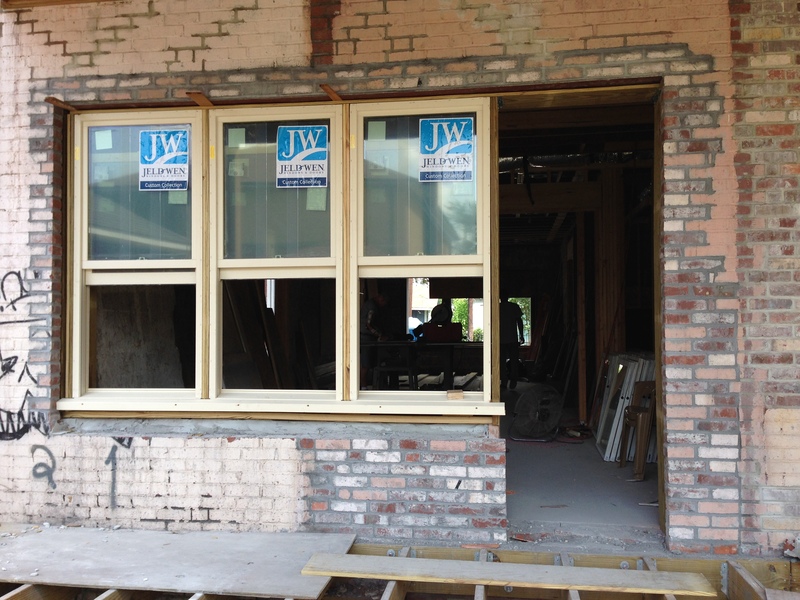 And finally, as of this week, the windows are in! You can really start to see what it’s going to look like when it’s all finished. 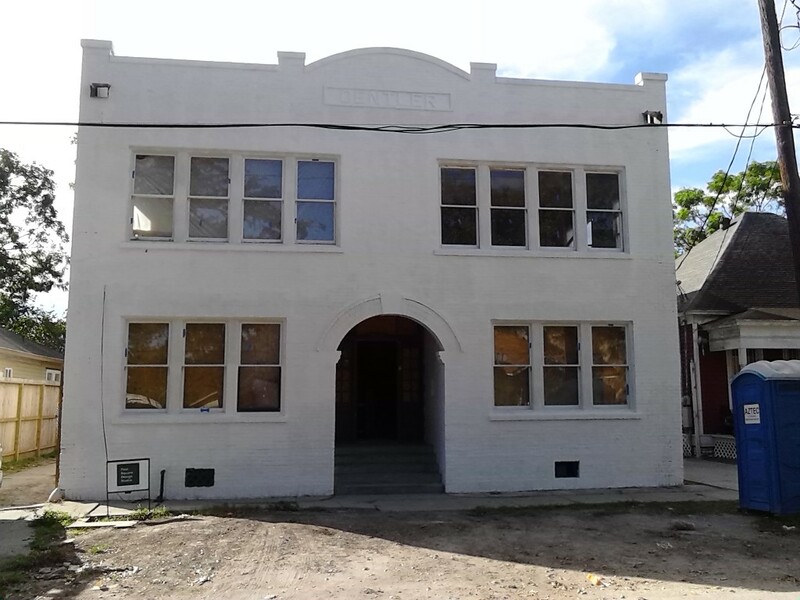 In the meantime, repainting has gotten underway. Don’t worry, it won’t be all white – this is the primer coat. (The sashes are going to be black, as you can see if you look carefully at the third sash on the lower left.) Also, the collection boxes and drains at each side of the façade are temporarily AWOL – the old ones were deformed and corroded, so we’re having replacements made. 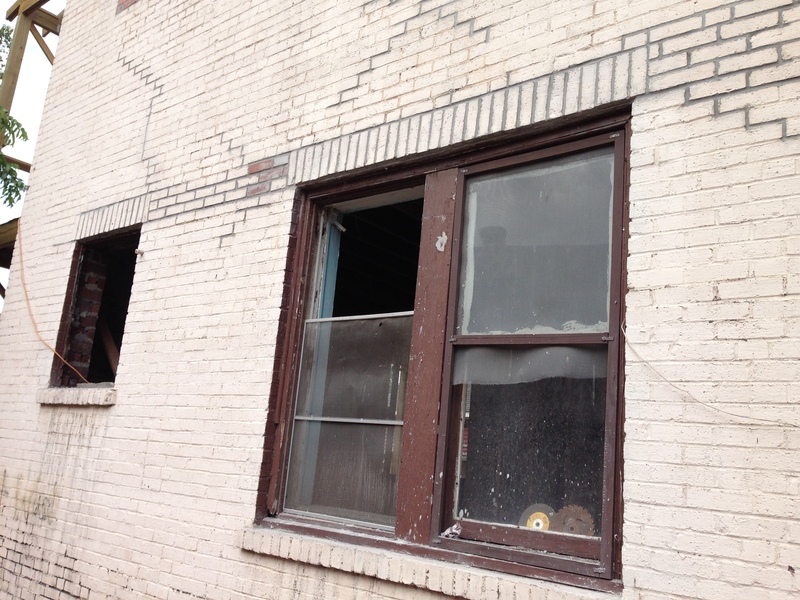 Here’s a close-up of one of the rows of windows downstairs. Still a few things left to do – weights and pulleys, sash locks – but it’s all coming together now. In the rear of the building, we’re taking a different approach. 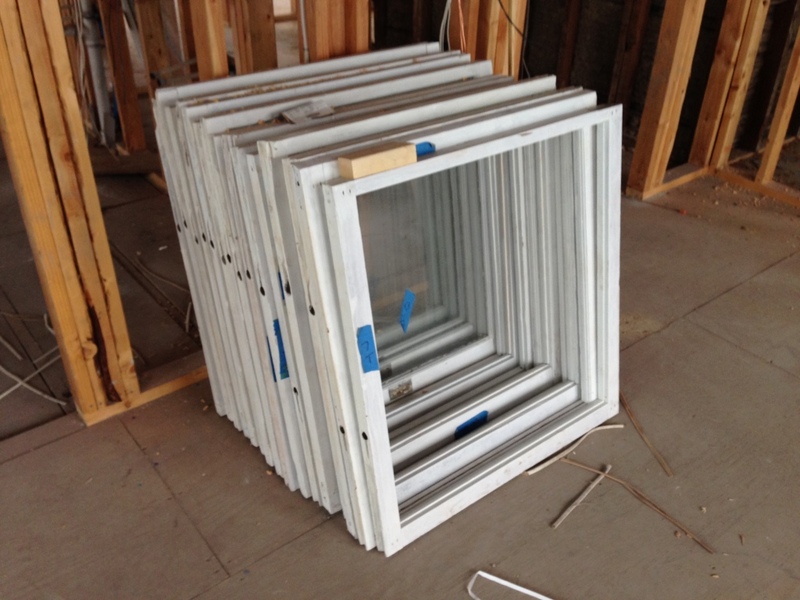 We’re adding more windows to look out onto a new two-story rear porch and the grounds in back, and to bring light into the interior spaces like the kitchen, family room, and master bedroom. Here, we went with new double-pane windows for sound-insulation reasons – there’s a train that runs a block away from us. These new windows are highly functional, but they wouldn’t have looked right on the front of the building – we’re very happy with our choice to preserve and restore the original design.